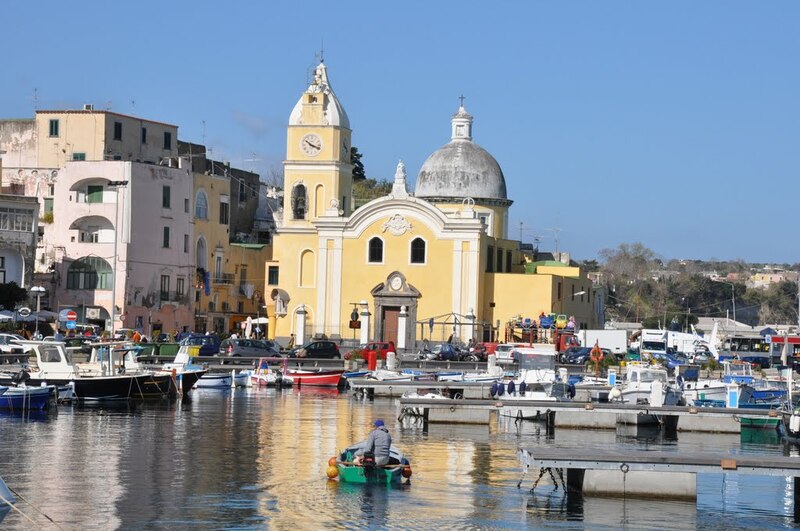 CHIAVARI, Italy - There are many things to love about the island of Procida, starting with its location in the Gulf of Naples. There’s the lushness of the gardens, the palm trees, the creeping Bougainvillea, the fragrant lemon and orange groves, the colorful pastel houses and the adorable three-wheel microtaxis that haul the weary up and down the steep road to the church of Santa Maria delle Grazie. The volcanic island may be tiny, just 1.5 square miles (3.7 sq.km), but it packs a wallop when it comes to beauty. 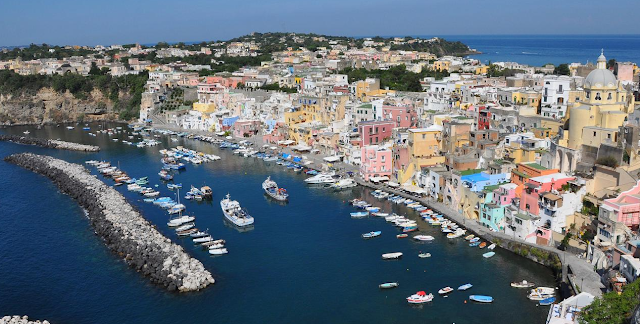 Its colorful villages and lush scenery have drawn filmmakers from Rome’s Cinecitta to Hollywood, and as you walk around, certain areas may look familiar, for Procida played a key role in the films Il Postino and The Talented Mr. Ripley. Procida is the smallest of the three islands in the Gulf of Naples, but one of the first to be inhabited That happened at some point between the 17th and 16th century BC. The Romans didn’t arrive until many centuries later. In the 6th century AD the island was annexed to the territory of Naples, and it has been a part of Naples ever since. The people of the tiny island know that they are often overlooked in favor of their more glamorous neighbors, Capri and Positano. But Procida has something her more famous neighbors don’t have, a simple, traditional way of life that is increasingly hard to find these days. 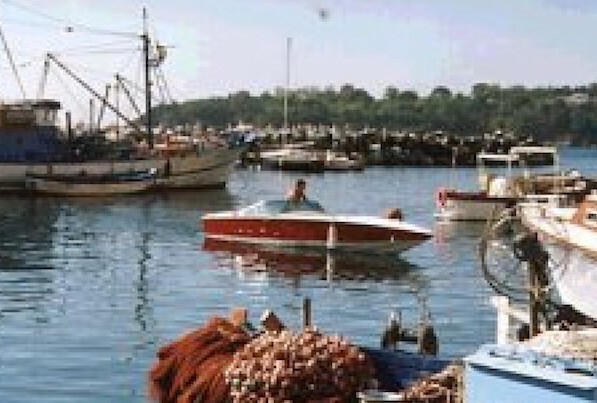 The island is home to 11,000 people, most of them from families who have lived here for generations. In some ways it’s the island’s small size that saves it from mass tourism. There simply isn’t a lot of room to build hotels big enough to hold tour groups. Most of the buildings you see when you come into Marina Grande, the main harbor, are private homes, and no one seems interested in having it any other way. On a clear day you can see all the way to Mount Vesuvius from the village of Terra Murata, Procida’s highest point. But the volcano was never the island’s biggest threat. 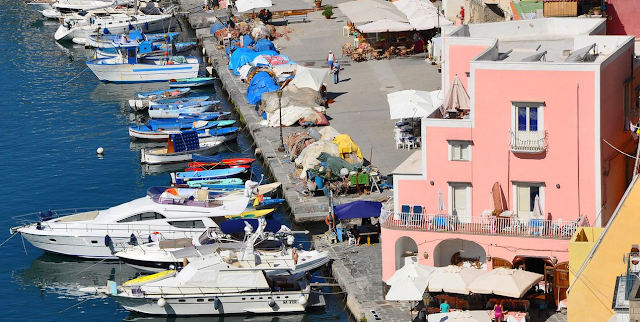 Starting in the 9th century, the Saracen pirates, who plied the waters of the Mediterranean, found Procida an easy target, forcing the terrified residents to seek shelter on this peak. In the 16th Century, in an attempt to protect Procida from the constant pirate attacks, the ruling d’Avalos family of Aragon built walls around the citadel, which is why it is called Terra Murata, or “walled land”. The pirates might be gone, but residents still live within the fortress walls. On 8 May 1535, Procida was once again attacked by pirates and took refuge in the Benedictine abbey in Terra Murata. According to local folklore, an image of St. Michael the archangel appeared in the sky, drawing his fiery sword. The image of the angel struck such fear in the hearts of the pirates; they ran for their lives. Every year on 8 May, the island celebrates the anniversary of St Michael’s apparition with an evening procession. It is one of the major holy events of the year. Market stalls in the shadow of the Abbey of Saint Michael Archangel sell hand-embroidered clothing and foodstuffs, including limoncello. The lemons in Procida grow with especially thick skins – perfect for Limoncello, which is made by steeping lemon zest in alcohol. OK, that's enough talk about the island, now it’s time to eat. This week’s recipes are two well known dishes, meatballs and spaghetti with clams, but with a Procian twist – a little lemon juice. You’ll be surprised what a flavor boost the lemon gives these dishes. I hope you’ll try them. Heat the olive oil in a large frying pan, and when it is hot, but not boiling, brown the clove of garlic. Put the clean clams in the frying pan, first removing the garlic clove. Cover the pan let cook over a low heat. When the clams open, remove them from the pan and strain the cooking liquid. Carefully wash the lemons, and with a vegetable peeler take off a very thin slice of the peel, taking care to leave the bitter white part. Finely dice the lemon peel and set aside. Squeeze the juice from the two lemons and strain the juice. Return the clams, the strained cooking liquid and the lemon juice to the frying pan, along with the crushed red pepper, the diced lemon peel and reheat everything together over a low heat. Bring a good amount of water to boil in a large pot, add salt and the spaghetti. When the spaghetti is cooked al dente, drain it and add to the clams and sauce in the frying pan. 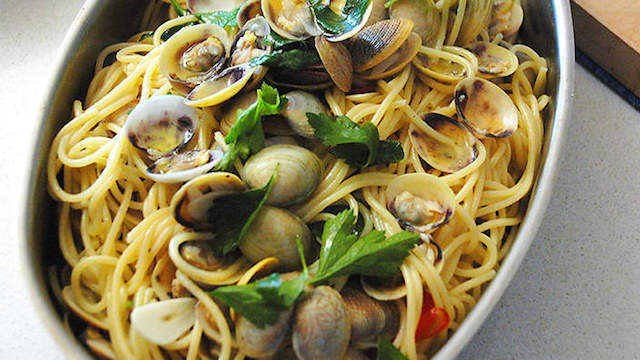 Turn the heat up and mix the spaghetti and clams, and add the chopped parsley. Serve in a large dish, sprinkled with some of the chopped lemon peel. In a bowl mix the meat with the egg, cheese, parsley, finely chopped garlic, salt and pepper and let stand at least an hour. 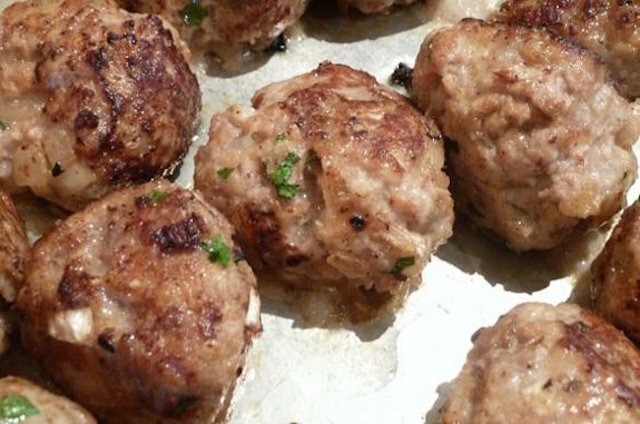 Then form the meatballs, (it helps if you wet your hands), and then roll them in flour, shaking off the excess. Next, put them in a pan with 3-4 tablespoons of olive oil and cook over low heat for about half an hour turning frequently. After a half an hour, drizzle them with the lemon juice, raise the heat and as soon as the sauce starts to boil, remove pan from heat and serve them, piping hot with a side of sautéed spinach and mashed potatoes. LIFE: The Man Called "Pinin"